Uriah Sherrill was born 01 Mar 1728 in Cecil County, Maryland, to Adam "The Pioneer" Sherrill (1697-1772) and Elizabeth Corzine (1701-1769). Adam Sherrill moved his family from Maryland to Augusta Co, VA, where he remained for a while, eventually deciding to move on to North Carolina. In NC, there was nothing but wilderness west of the Catawba River in the 1740's. The only inhabitants in this area were the Indians who hunted and fished there. At that time, all the settlers coming westward stopped on the eastern side of the Catawba River and settled there. The western side was most uninviting and not knowing anything of this area, the settlers did not venture west to find out just what was there. That was until, 1747. In 1747, Adam "The Pioneer" Sherrill and his family, along with other family members and friends, moved to the west side of the Catawba River in North Carolina. Most of the group were of German origin. Today, Adam is known as "the first permanent white settler west of the Catawba River". His arrival in the area pre-dates Daniel Boone's arrival in the area by at least 10 years. Adam Sherrill's home was located about a mile from the banks of the Catawba River near Sherrill's Ford and Terrell, North Carolina. Adam Sherrill and his wife Elizabeth Corzine had at least nine children. Uriah would have been about 18 or 19 years old when his family crossed the Catawba River and built their home. Uriah "Ute" married Judith Lewis on 25 Dec 1753 in what would have been Rowan/Anson County, NC, at the time. Judith was born 10 Feb 1735 to David Lewis to Mary Crawford. Uriah's marriage to Judith produced at least twelve children. The French and Indian War (1754-1763) occurred not long after the Sherrill families moved west of the Catawba River. It refers to the two main enemies of the British colonists: (1) the royal French forces and (2) the various American Indian forces allied with them. The British colonists were supported at various times by the Iroquois, Catawba, and Cherokee Indians while the French colonists were supported by members of the Wabanaki Confederacy as well as the Algonquin, Lenape, Ojibwa, Ottawa, Shawnee, and Wyandot. At the start of the war, the French North American colonies had a population of roughly 60,000 settlers, compared with 2 million in the British North American colonies. The outcome was one of the most significant developments in a century of Anglo-French conflict. France ceded to Great Britain its territory east of the Mississippi. It ceded French Louisiana west of the Mississippi River (including New Orleans) to its ally Spain in compensation for Spain's loss to Britain of Florida). As a result, Great Britain became the dominant colonial power in eastern North America. 1759: Uriah "Ute" Sherrill of Rowan County, NC, allowed 1 pound 15 shillings for cows killed by Indians for provisions going to the French and Indian War (1754–63). 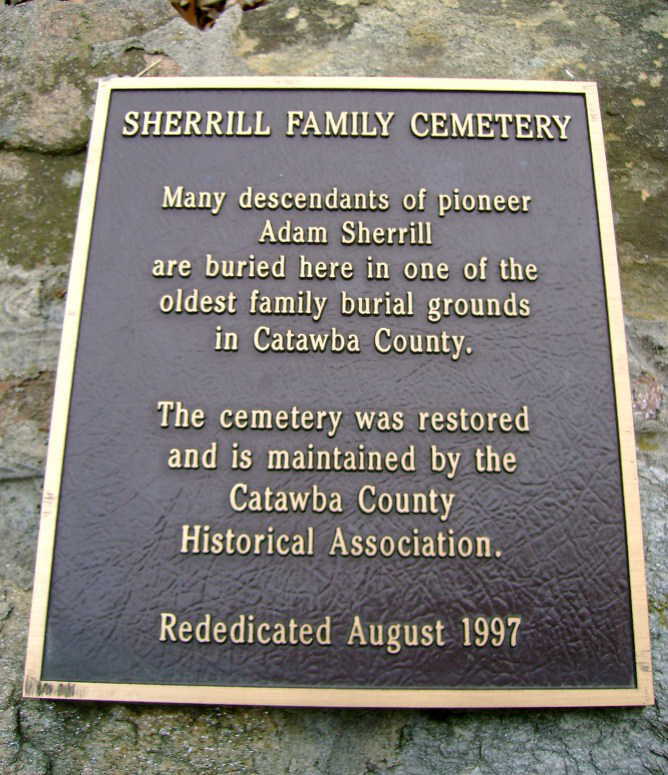 Uriah's father, Adam "The Pioneer" Sherrill, died 05 Mar 1772 in the Sherrills Ford area of Rowan/Burke/Lincoln/Catawba County, NC, at the age of 75. Uriah died 27 Nov 1779 in Sherrills Ford area of Burke/Lincoln/Catawba County, NC. He was on 51 at the time of his death. Judith Lewis Sherrill died 27 Sep 1815 in Burke County, NC, at the age of 80.